It’s April 10th, and you know what that means, don’t ya? 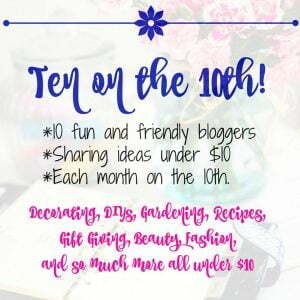 It’s time for Ten on the Tenth when my blogging friends and I bring you some of our favorite items that cost under $10. 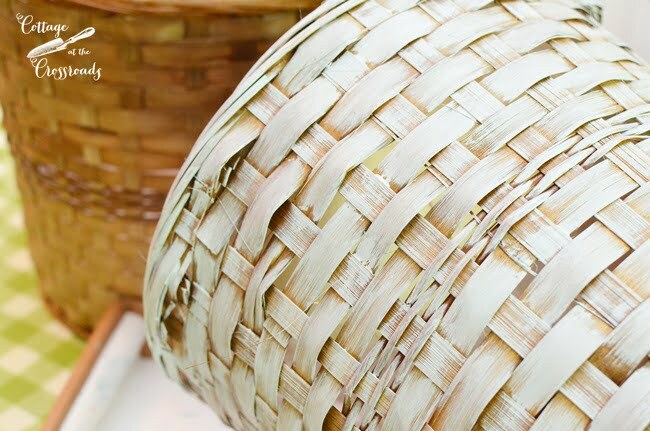 Today I’m sharing some painted wicker plant baskets. This project started with the fact that my sister-in-law and I were providing flowers for our church, and we decided that we would do our own flowers by putting some blooming plants in pretty, spring colored baskets. Well, when we started looking around for some baskets, we discovered that these kinds of plant baskets are not as readily available as they used to be. But my SIL Jean found some at a florist shop located in a local grocery store priced at $6. I think you’ll agree with me that they look a little drab in their natural color. 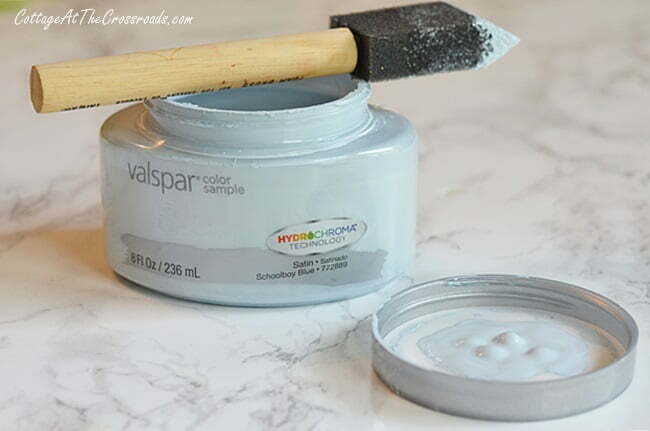 Now I don’t know if you’re aware of this or not, but these sample pots of Valspar paint that you can get at Lowe’s are a real bargain. They are only $3.48 (odd price, I know!) This color is Schoolboy Blue, a really soft grey blue. Well, I whipped out a sponge brush and went to town on the two baskets! I like to let a little of the natural color show through when I paint baskets. So I just put a little paint on my sponge brush and brush it back and forth (never go up and down!) 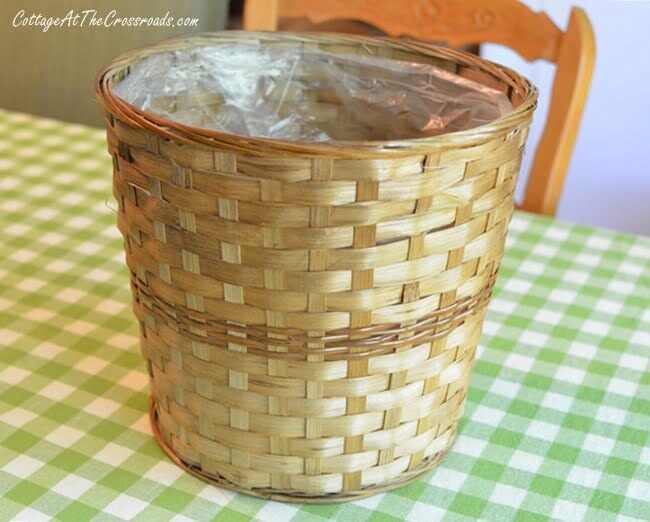 This is a quick way to paint baskets! I might add that I was listening to some of my favorite music while I was painting! 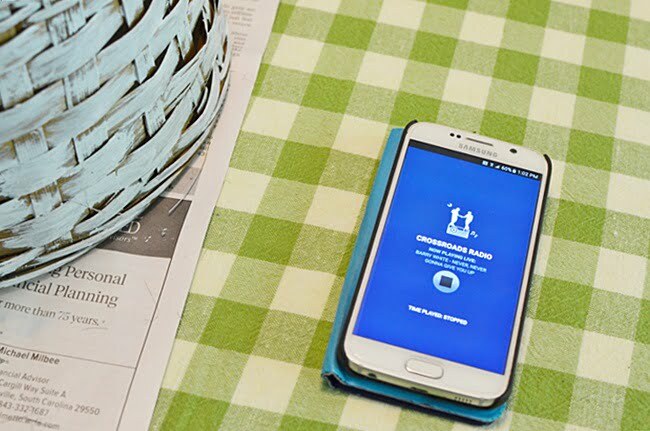 If some of you are new here, you may not know that we have an online radio station (shameless plug!) You can click HERE to listen. 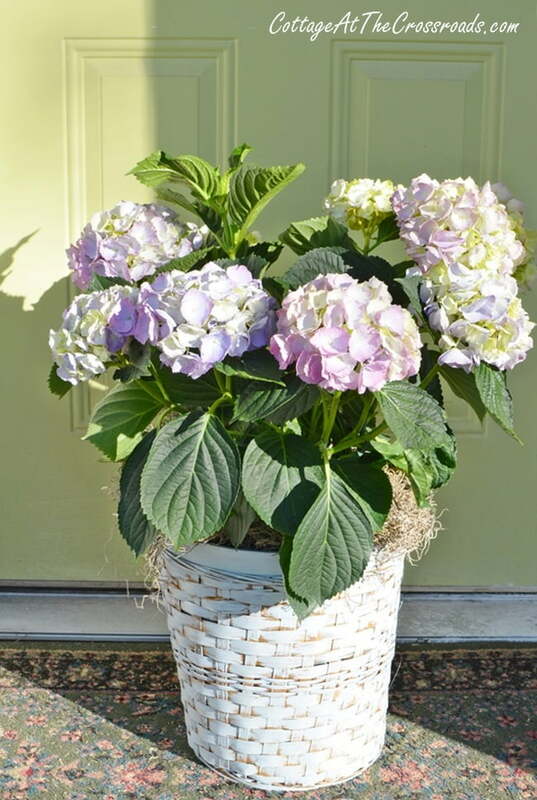 My SIL and I went shopping (again) at Lowe’s where I had seen these gorgeous hydrangea plants earlier in the week. Our plan was to just drop the pots into the baskets but we discovered that the top of the pots didn’t quite fit down into the baskets so we had to quickly paint the tops of the pots. A little Spanish moss dressed the top of each basket. This type of hydrangea is called “Bigleaf” because of its large, spiky leaves and the flowers are called mopheads because they are large and round. It is the old fashioned cultivar called “Mathilda Gutges” that turns deep pink in neutral soil and an intense violet blue in acidic soil. I have been moving this one around since I brought it home from church because it needs shade in the afternoon. 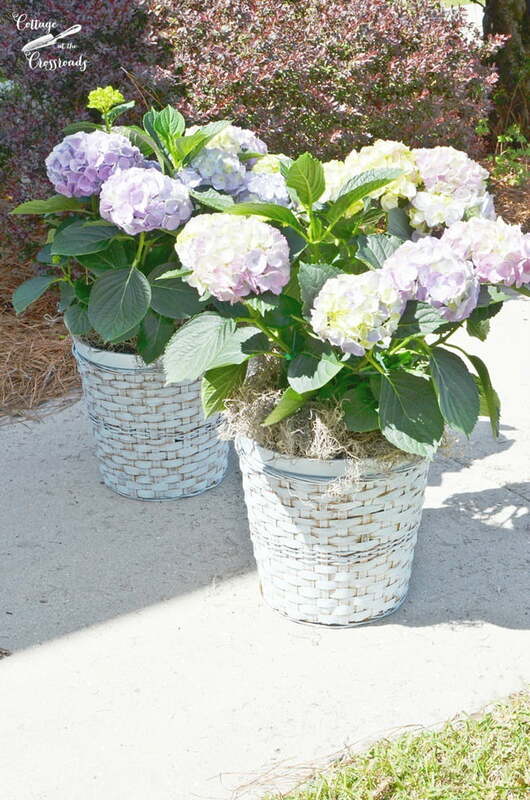 The hydrangeas look so pretty in the painted wicker plant baskets, don’t you agree? The transformative power of paint never ceases to amaze me. And the cost of the basket and the paint was under $10! And I have plenty of paint left over for more projects! Lucky me! 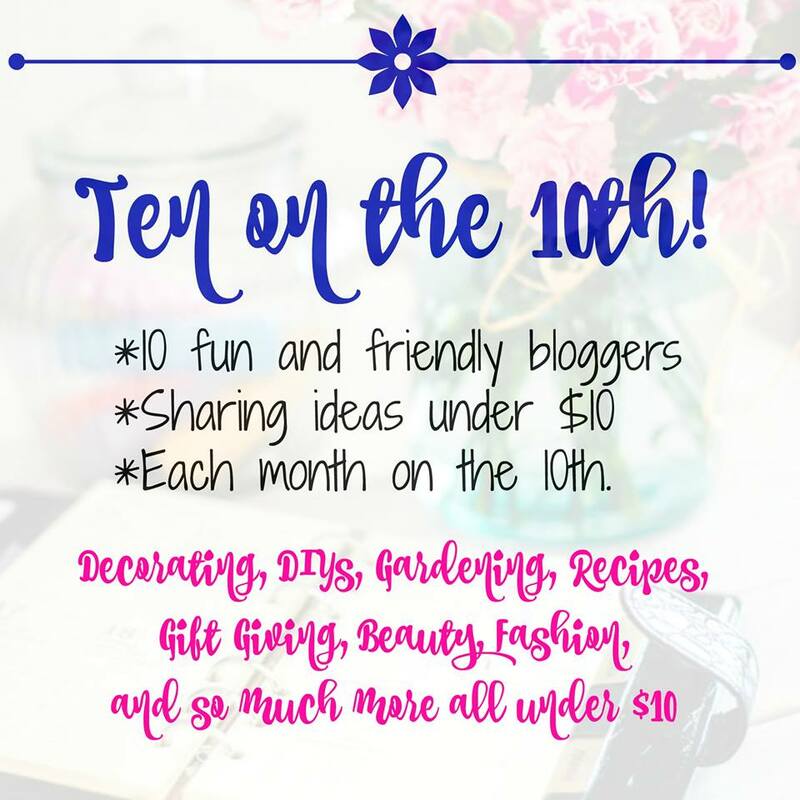 Now let’s see what favorite things the other ladies have to share with you today. Just click on the links below to visit. 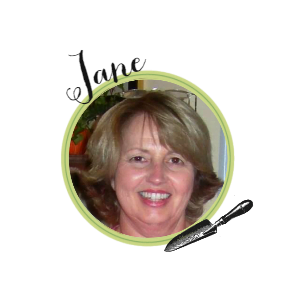 So pretty Jane, and a great way to spruce up a plain basket. The baskets look great painted! Beautiful flowers. I love how you updated your baskets. May you enjoy a glorious spring and a wonderful week! I couldn’t agree with you more! In fact. my mantra is “a little paint can be transformational!”. You’ve certainly proven that here – lovely baskets! And those hydrangeas are just stunning. That turned out great! Love the hydrangeas with the pretty blue. A bargain indeed! There are so many things I love about this project. 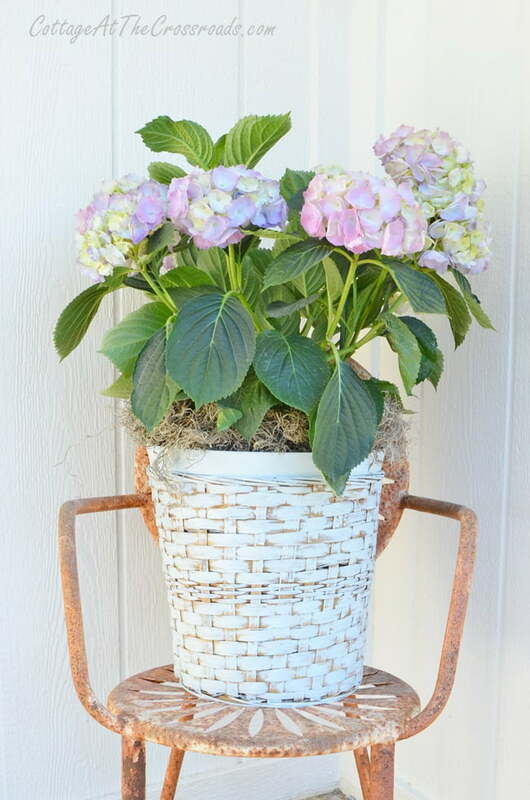 The price, the paint color, and hydrangeas of course. I did not know you had an online radio station!!!! Jane, painting the wicker basket was a great idea. It made such a difference. I’ve done that many times, too. And the hydrangeas are just gorgeous. Great use of baskets! Love them with the hydrangea. Love sprucing up old baskets with a little bit of paint. These look wonderful and they appear to have more detail now which is a nice combination with those beautiful hydrangeas.